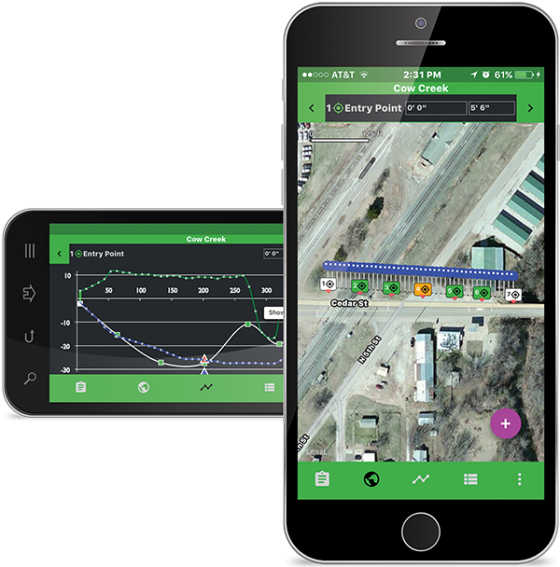 The Field Scout app works with your Apple® or Android™ mobile device, allowing you to walk the intended bore path of your next job and record important waypoints and obstacles such as the entry pit, exit pit, and utility crossings. Field Scout reduces the chance of errors by replacing pad and paper, and by giving you the ability to use GPS. Transcription errors are also minimized as Field Scout lets you share your plan electronically. From Field Scout, you can email your plan to a supervisor, owner, or client for approval or further action. You can send it to crew members to show what daylighting needs to be done. Best of all, when working with ScoutView, you can upload your plan to the Commander™ 7 HDD Guidance Display for reference while boring. You can even see your As-Built and bore plan together after the bore. 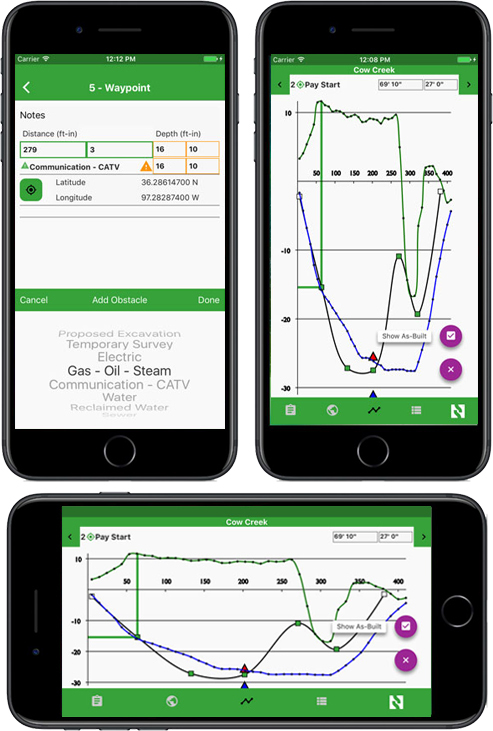 Planning and reporting with Field Scout can reduce your risk and make your drill time more efficient, improving profitability on every bore. Simplifies formal planning, minimizing risk and making the actual drill time more effective and efficient. Creates a basic bore plan before crew and equipment are on site, saving time on the job which makes bores more profitable. Allows you to mark critical points such as entry and exit pits, utility crossings and more with distance information and depth. Lets you set minimum separation for utilities. Gives you the ability to take pictures of utility markings and pot holing and store/email those with the plan. Works with GPS (optional) to reduce time spent making distance measurements. Can be emailed directly from mobile device for approval, further action, or for the job file. Enables daylighting ahead of time. Works with Commander 7 HDD Guidance Display, allowing you to see critical waypoints as you approach them. Available for both iOS and Android mobile devices.